Much of June was to be spent in the French Maritime Alps, but at bedtime on June 9th the cusp on one of my molars snapped off, the attached inlay fell-out, and Map Man's plans disintegrated before our eyes. We had just officially entered the French Maritime Alps with our ascent of the Col de Turini that day and were miles from anything at that moment other than 3 small hotels. No longer was an extended tour of the French Maritime Alps that poised us for a dash east to the Dolomites possible. Instead, the next day we returned to the seaside at Menton, France to have impressions made for a new inlay. Suddenly we needed a loop to fill-in the 2 week interval between taking the impressions and actually cementing the new piece in place. Beautiful mountains were in our future again. Map Man had his work cut-out for him as it was about 7 pm when we were out the door of the Menton dentist's office after having the impression made. It was less than 24 hours since the dental work failure and Bill was still grieving the loss of his Maritime route. But this unexpectedly quick remedy to a cumbersome problem gave us a fixed time table. We could be back pedaling in the morning--if only we knew where we were going. But we don't call him Map Man for nothing and as soon as we were back in our hotel room and the maps were in his hands, Bill began cobbling together a new route. Train schedules were critical this time for this route planning. He had the dual constraints of being boxed-in by the 2 week dental ritual and also the need to arrive in the Dolomites on the afternoon of July 4th. Bill's new plan would use trains to both catapult us north into the mountains and to whiz us back to Menton so I could be in the dentist's chair at the appointed hour. 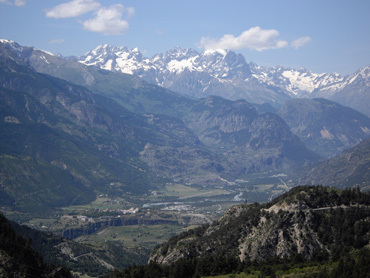 Ultimately it was the train networks that dictated the larger route and our "French Maritime Alps" tour became a tour of the "Alps of the Italian-French Border Region." Weighting the itinerary more heavily towards the Italian side would mean more time in the saddle and less in the train cars over the next 2 weeks than if we were taking the trains from French destinations. It's not that the French train service is inferior to the Italian system but instead the realities of the geography and how the rail network of each country was conceived made the Italian system more efficient for us. 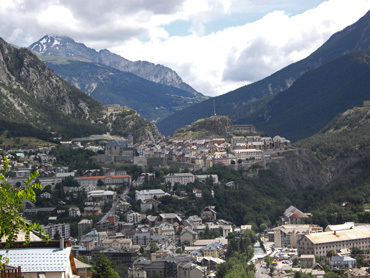 With what was left of our evening in Menton, Bill outlined a 2 week route back into the Alps. Many of the segments for his hurried plan were routes he'd considered and rejected when crafting his original Maritime Alps itinerary. The bonus from having the new route being partially in Italy was that we'd have our own internet service access--we had an Italian service provider but not a French one. The internet access, especially the first few days of this mini-tour, meant that he could do more of this revised route planning on the fly. Bill was looking like a star. In addition to developing a new route, the next day would be Day 2 since my dental work failure and it would be a riding day as well as a train day. It looked like he was up to the challenge of meeting my request to not de-condition despite the layer of complexity that daily riding added to his planning. Map Man's new route used the Italian trains to take us north and west of Col de Turini where our tour of the French Maritime Alps came to an abrupt end 2 nights before. Our bike-train-bike day on the first day of our 2 week loop landed us in Borgo San Dalmazzo, Italy which turned out to be a real find. Borgo is in Cuneo Province and Cuneo Province seemed to be self-appointed as one of the biking capitals of Europe. Bike hotels, bike routes, mountain bike competitions, and bikers abounded--we were in biker heaven. But I was deeply impressed with Borgo for another reason, even before Bill collected hotel and cycling information at the tourist office. On our way into town we were drawn to pause at one of those roadside memorials that one comes upon too quickly when in a car to stop for a visit. But with bikes we could easily slip onto the grounds for a closer look by turning into the short exit driveway. 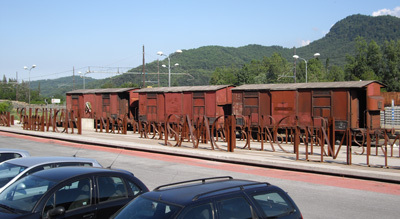 Borgo's memorial to the Jews deported during WWII. I was immediately taken-aback by what was to me the deeper significance of the memorial to the deportation of Jews from Borgo in WWII. As best as I could remember, it was the first memorial outside of Germany where a community or a country publically declared their shame. Outside of Germany, wartime memorials are universally to the valor of the country's people or to the suffering they endured. Their victim-status is often publically declared but never their complicity in creating victims. But at least some citizens of Borgo had decided it was time to come clean. There was no date on the memorial but our guess was that it was perhaps 5 years old--either its initial construction or a renovation. The memorial listed the names of all 355 Jews that had been sent to concentration camps from their town. All but 20 perished in the camps and most had come via France. No wonder there was conflicting information about the roads. A few minutes later as I waited with the bikes in the shade while Bill was getting the low-down at tourist info, I noticed that Borgo's city library was the "Anne Frank Library." And Borgo had a number of WWII memorial routes marked in the countryside around their city. I longed to know more about the "who, what, and why" of this reflective posture in Borgo but as travelers not being fully conversational in the local language, I knew that tracking down that information could be very difficult and we were left to wonder. When Bill was in the tourist info office in Borgo asking for lodging info, a non-English speaking cyclist had the clerk translating for him so as to inform Bill of some of the local "must-do" routes. With recommendations like that, who could resist. But Bill had a new 2 week plan and we intended to stick to it. However in the next hour the local cyclist's endorsement was combined with an unexpectedly nice, bike-friendly, moderately priced hotel that had us staying an extra night to do the premier day ride. We enjoyed the recommended day ride but didn't share the local man's enthusiasm for it. However we did have his level of enthusiasm for our next day ride out of Vinàdio due west of Borgo, near the French border. The deep gorge widened to a broader upper valley. Unlike at Borgo, the day ride out of Vinàdio had been a planned one as day rides were solving multiple problems for us. 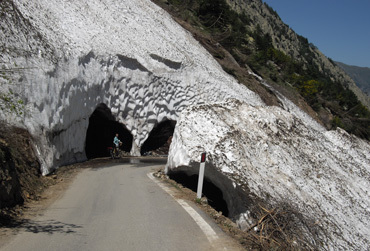 It was hard to get definitive information about which of the passes were open and a day ride was an easy way to see the best scenery without the disappointment of discovering that our through route was closed. Not carrying that extra 60 pounds in weight meant we could go farther in a day and see more. And day rides extended our time in Italy, giving Map Man more internet access time for his on-the-fly route planning. The ride south out of Vinàdio towards Isola in France was stunning even though we resisted the temptation to overextend ourselves by pressing on to the top. It was one of those water-carved valleys that repeatedly narrows to deep gorges and opens to broader, near-meadow-like areas. The always-changing panoramas delivered what we go looking for in the mountains. 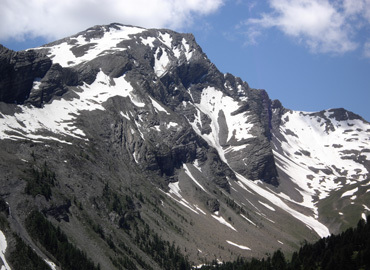 The deep piles of snow and the extensive damage to the forests and the roads explained why we'd gotten conflicting information in both France and Italy about which passes were open and which were still closed. All of the trees on entire slopes had been flatten in some areas and downed trees and rock debris were deeply layered into some of the snow piles. Flattened railings were 1 sign of the wild winter weather. It was hard to imagine one story that would explain all of what happened this last winter. There must have been a couple of huge wind storms; perhaps a freeze-thaw cycle or 2; a late, heavy snow fall; and maybe some avalanches. We've seen the aftermath of flooding and windstorms but the strewn evidence before us spoke to a much more chaotic series of events. We were quickly back into France with the cresting of our first pass of the revised tour being Col de Larche. Our host at the tiny mountain village was pleasant and accommodating which made it all the more shocking a couple of nights later when we again ran into the dark side of the French mentality. It was when we made a planned stop for the night mid-way up one of the passes and the host at the mountain village inn for hikers, cyclists, and motorcyclists was obliged to recite the rules to us in French that seemed only for us. It was the first time we've ever been verbally told that we couldn't eat any food in the room--on rare occasions when that is a house rule, it is posted for all, not just told to us. 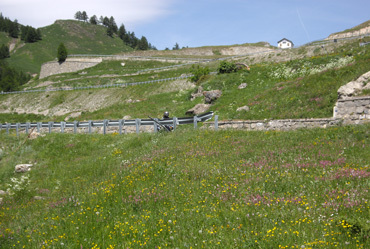 The first set of switchbacks on the Italian side of Col de Larche. Unfortunately this lecture came on the heels of an unnecessary bit of rudeness in Menton, which was making the French again look disproportionately defensive/snooty/difficult. In Menton when we inquired at one hotel as to whether they had an indoor place for our bikes I was told "Madame, this is a hotel, not Club Med." In nine years of asking that question almost daily everyone else has managed to politely respond with "Yes, no, or maybe." I continue to be baffled by this confrontative posturing in France. Oh well...one of the burdens of traveling. Road closures were a bigger problem for us in 2009 than is usually the case. 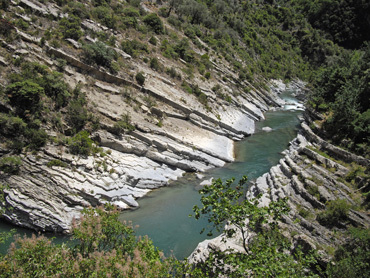 Weeks earlier on the coast of Italy, what should have been a flat, easy ride along the water's edge, was made more robust by a closed road--a road that may not ever reopen. We'd seen numerous signs about the closure and one of our hostess's was kind enough to check with a cycling friend to make sure that bikes couldn't slip through. Often as cyclists in Italy we are allowed to pick our way through a road construction site but this route was completely blocked by landslides and we were forced to take the tough uphill detour to carry on. 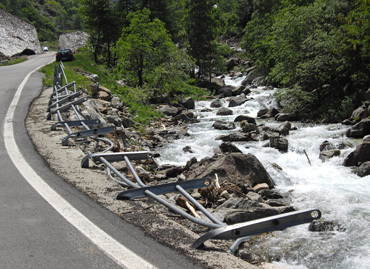 It wasn't long afterwards that we had to detour most of the day around a closed road out of Sospel, France in the Maritime Alps that came without any warning at all. Bill was able to salvage the day's big climb to Col de Turini, but it added unwelcome extra miles and elevation gain, plus it added uncertainty to an already hard day. 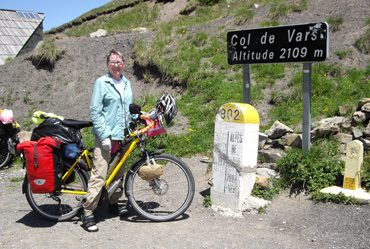 The skies cleared as we progressed up to Col de Vars. 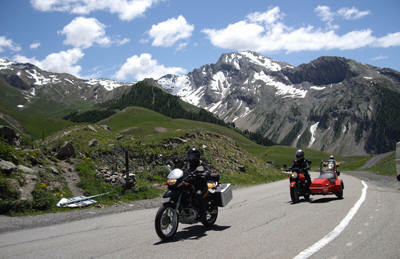 The most baffling, the most annoying closure however came when we traversed the Col de Vars in France. Bill had started checking online for road closures and this particular route had a notation that there was road work but traffic was controlled by signals--a ordinary event. We were stunned when we arrived in the rain at the approach to the day's climb to see a huge orange sign indicating that the road was closed in a couple of miles though it would be open for an hour at lunch. We were puzzled however as there were no construction trucks whizzing by, so we decided to proceed to investigate. A few miles past the closure sign, we came to a row of plastic Jersey barriers and a chain blocking the road, plus the numerous German and Austrian motorcyclists and cars that had passed us. Since they hadn't come back, we'd taken comfort in thinking the road was open. We chatted with them a bit and it was clear that they knew no more than we did but they'd decided to violate the barriers. We pedaled under the chain that one man held up for the motos and didn't wait to see how they got their cars around the barriers. Somewhat apprehensive, we pedaled on but still saw no sign of construction. When we arrived at the next set of barriers and chain, a young French man wearing a reflective vest rolled out of a truck and began asking us something to the effect of "What in the hell are you doing?" Given that the motos had clearly gone ahead because they weren't in sight, we figured we were doing the right thing. It was busy for a closed road. As the French man struggled to muster enough English to harangue us, the Germanic motorists arrived at the barrier and the French man asked us to explain what they were doing here. Fortunately one of the drivers had decided to be the spokesperson for all of us and came up with the lamest excuse in English as to why his group must pass through the barriers. Incredibly, the young man unlocked the chain and let us all through while still protesting. We were comforted when Bill asked the young man if they were blasting rock along the way and he said "No" but there could be falling rock. We rode and rode and there was still no sign of road work but noted that there were a lot of vehicles going by us in each direction for a closed road. We chuckled as most of them had foreign plates and decided that the crews had settled for decreasing though not eliminating the traffic. We only lingered long enough for a photo at the top. After an hour and a half of climbing, we paused for a quick lunch and at about 11:45 a pack of a dozen motorcyclists roared up from behind. They heralded a steady stream of traffic for about the next 10 minutes and we guessed that all the vehicles behind the barrier we'd crossed had been released early and would arrive at the work site when it opened at noon. We curtailed our traditional lingering at the top of the pass after the very difficult climb so as to decrease the risk of getting trapped on the road until the next opening time at 6pm. We were already past the 1 hour lunch time open period but didn't want to press our luck any further. 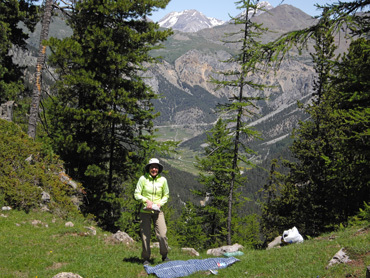 But as we headed down from Col de Vars we noticed small touring groups enjoying lunch at top-of-the-pass restaurant and families picnicking along the way. Clearly they had no concerns about getting stuck behind a construction closure and we were even more puzzled. Valley-floor Guillestre was in a dramatic setting. Amazingly, when we finally arrived at the road work well down the other side of the pass, we discovered that the road wasn't even closed to traffic at this end. There was construction work on the main road through a lower town, perhaps for a mile or so, and traffic in both directions was being diverted onto an adjacent road. We were absolutely taken aback. Who ever heard of a road being closed at one end and not the other? It wasn't even that it was set-up as a one way road as it was blocked to traffic in both directions where we passed the 2 sets of barriers. We certainly would have felt the fools if we'd respected the road closure signs and cancelled reservations while Bill plotted an alternate route in the rain. When we arrived at our destination town for the night, Guillestre, Bill asked tourist info about the road closure to assess the quality of their information for the rest of our route. The clerk there was absolutely certain that the road work was going on in yet another town, a town that we and the main road bypassed. The day's experience left us laughing and horrified. Bill had checked online for closure info, he had asked, and all of the information was still wrong. Incredibly we'd done the absolutely right thing in confronting the kid with the key to let us pass by the barriers because the whole thing was bogus. That must be why he reluctantly let us and so many others pass. What a horrible job the young French man has--to be in the position of blocking a countryside road at one end for construction within a town miles away that has no effect on the countryside road. 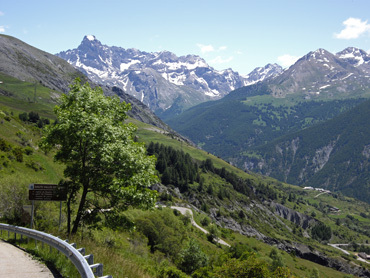 The scenery near the top made Col d'Izoard worth the effort. This road closure nonsense topped them all. We've learned that in Italy that a closed road is a "maybe" situation and we check it out--we didn't even know what to conclude about France in this situation. 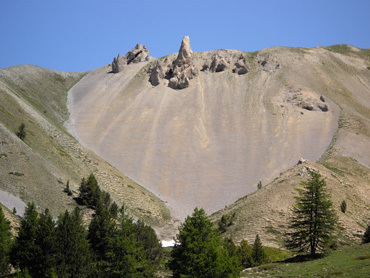 Col d'Izoard between the cities of Guillestre and Brainçon was Map Man's 'trophy' pass on his Menton-to-Menton route. It is one of the passes the Tour de France riders regularly punish themselves on. Unlike the Tour riders who click-off multiple passes in a single riding day, we'd take 2 days to complete this single high pass at 2360 meters or about 7,750'. Curiously, the first day of the 2 day assault on the pass was to be the hardest of the pair even though the distance was shorter and the grades less-steep. But I was pooped and Bill was really dragging at the end of this first day. Bill seemed to be in some metabolic chaos as he could barely eat enough to keep going. Big smiles--we were almost to the pass. Our less-than-stellar performance on the first day made us apprehensive about the following day that would be weighted heavily towards near-10% grades. Inexplicably, we both had a better day on the more difficult of the 2 days. I'm suspicious it was the very chilly, persistent wind that kept us from overheating that transformed us into more powerful and efficient climbing machines. But perhaps it was that the 3 day progression from rest day/moderate day/very hard day was just right for fortifying us for the big effort. We were thrilled to make the hard climb with power to spare but our confidence would have been bolstered even more if we'd known what had contributed to everything being just right. The scenery just shy of the top of Col d'Izoard on the southern approach was absolutely stunning. Should you be on a driving tour of this corner of south-eastern France on a clear day, and you aren't squeamish about cliff-hanger roads, take the time to drive this narrow bit of road. The lighting when we were there around noon was all-wrong to do justice to the scenery in photos, but the desert-like landforms were incredible. Our sheltered picnic spot was on the less-scenic side of the pass. Our long descent from Col d'Izoard in the Queyras Park region to the city of Brainçon was one of those idyllic afternoons. We'd seen incredible scenery on the way to the top; we'd crested the difficult summit in fine form; we'd lingered at the top for almost an hour amidst the energetic buzz of other cyclists while talking with some hearty older riders from California; and we'd found a scenic spot for our picnic down the slopes and out of the cold wind. Ah, now that's a grand day in the mountains. We rested a day in Brainçon at a pleasant family-run pension we discovered last year. The air was cold here too and a long walk was my recovery activity before our last pass, Montgenvre. After this lower pass, we continued biking and crossed the border into Italy. 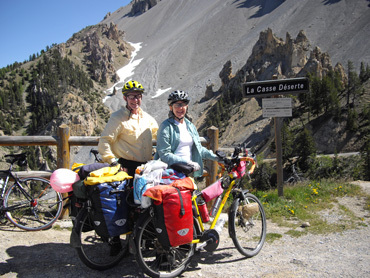 Oulx, Italy, was to our most northern point of this route, the farthest point from Menton. Then it was 2 days of bike-and-train to sling-shot us back to the sea, back to Menton. Bill cleverly routed us by train from Oulx to the west of Torino to Tende, directly south of Torino. That allowed us to spend our last riding day in the region making a nearly 50 mile, mostly downhill, traverse of a deep gorge from Tende to Ventimiglia, Italy and then along the sea to nearby Menton, France. "Stop!" was what prompted Bill to turn his head as he paused at the broad white line on the asphalt that marked the termination of our officially closed, narrow canyon road where it intersected with the almost 2-lane main road. "This is it. This white line--this is our equivalent of Harry Potter's Platform 9¾'s." Off in his own thoughts, his blank expression transformed into a laugh as he understood. I elaborated just to make sure: "This white line under our front wheels is where the magic of the mountains stops and the ordinary begins." Views like this were now only a memory. We'd crossed over the very same line a little over 2 weeks before as we ventured from the French Riviera into the Maritime Alps. But when we crossed the line going the other way--heading into the mountains--we didn't know what laid ahead, we didn't know then that this was the exact spot where the magic began. The magic of being in the mountains took-hold slowly as we entered them not knowing if it would come and go or continue uninterrupted for days or weeks. But now I felt the magic in the air being sucked out--we could feel it leave because as we knew exactly what was ahead as we'd been in the very place before. It was like a vital force had just evaporated from our beings, from our world. I'd had the same experience every time that we'd exited the Dolomites but this was the first time I could stand on a painted line and say "This is the spot--this is our Platform 9¾'s." Usually its a feeling at consolidates over the course of an hour and I recognize and perhaps announce "We're here" or "It's over now, we've left the mountains." For me, some mountains have a magical quality about them. Our Cascade Mountains back home, the Pyrenees, and most other mountains don't flip the same switch inside of me. My experience of those mountains is always that they are "over there". Even when you drive or climb higher up in them, their dramatic surfaces are always far away, always "over there." In contrast, in the Dolomites and some regions of the western Alps, the mountains are always "right here." Their deep gorges and sheer faces are touchable: you can get right up to them, put your hand on them, and then look up at them for perhaps thousands of feet above you. The last evidence of the mountain terrain. As Bill pointed out, it's not about how tall the mountains are or how great the elevation is, but instead it is how far they are away from you on the horizontal plane. For me, these mountains trigger the ongoing delight like the fun of fireworks on the 4th of July in the US. The visual spectacle of both come at me in rapid succession. It's "Ooo, look at that one; quick look over there; oh, there's another one." "Bam, bam, bam" the fireworks go off and create a stream of visual surprises. Being in these mountains is like that for me: a stream of visual delights that pulls my too-practical mind out of its orbit of "must's and should's" and moves it into the lost territory of child-like wonder. Nice views and pretty sunsets will do that for a few moments, but being surrounded by certain types of mountain scenery clicks my brain over into an altered state and leaves it there for the duration of our stay. It's that power of some mountains to transform something inside of me, to alter my state of being, that keeps me coming back year after year. And being on a bicycle or on foot extends the experience to days or weeks, an experience that in a car would be over as quickly as an evening of summer fireworks. Like a great social connection or an outstanding vacation where external forces pull one outside of themselves and into a more expansive and energized place, being in these western Alps of France and Italy had catapulted us into a deeply satisfying sense of being. But it is one of those special places, one of those in a class of 'sense of wellbeing' places we can't get to on our own, its a place we only get to with a boost from the outside. Ventimiglia had been having some fun while we were away. As we stood on the white painted line at the road junction I had felt the 'pop' of the altered state as it burst and vanished. I looked back up at the canyon walls we were leaving and down at the road that would deliver us to the sea in a few miles. I knew where I wanted to be; I knew where I had to go. It was was once again time to return to the normal world. Last fall when we extracted ourselves from the delight of the mountains it was the coming snows that drove us out, this time it was another bit of pragmatism that compelled us to leave: a visit to the dentist to have my replacement inlay seated. A looked down that road and fortified myself with what there was to enchant me ahead. The sparkling blue Mediterranean on a sunny late June day; the refreshing city park in Ventimiglia with its huge trees where we'd eaten lunch before; the cheery flower garden at Menton, France's park where we'd finish the day; and the many promenades along the way. We'd been on this stretch of coast a couple of weeks before and it was beautiful, it was delightful, but it lacked the transformative powers of being in the mountains a short distance behind us. Coming back to reality at this particular moment had been solely for the purpose of having my new inlay cemented by my new French dentist. Had this dental emergency not arisen, we'd still be savoring the mountain views. Without this dental glitch, we would have had an almost seamless transition from the western Maritime Alps to the Dolomites of the eastern Alps. 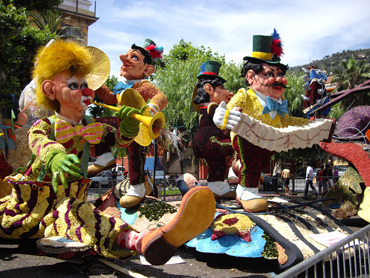 Fortunately, everything clicked into place as expected in Menton. The bike-train travel of our arrival day went as planned and we checked into our hotel that was a few blocks from the dentist's office. The next morning my inlay was installed and we were on the road by noon. In keeping with my desire for daily riding, this traveling day would include a short ride before we hopped on a train that would once again take us away from the sea. Overworked Map Man had 10 days to transport us from Menton on the French Riviera to the village of Selva deep in the eastern Italian Alps. Tonight is the last of our 8 night apartment stay in Corvara, over Passo Gardena from Selva where we spent 17 nights. 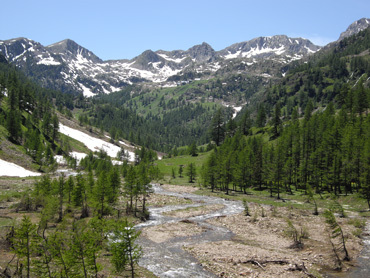 Tomorrow we make the short ride over Passo Campolongo to the even smaller village of Arraba. It will be an easy day so as not to do 2 passes in a single day. Then it's over the very steep and taxing Passo Pordoi to the hillside ski resort village of Vigo. We'll spend 3 nights each in Vigo and Tiers, both still in the Dolomites of northern Italy, so as to hike 2 days in each area. After that, we'll be heading into Austria as Bill has his eye on a new hiking area there. The current heat wave to the south of us has temperatures tipping the 100° F mark so we are in no hurry to drop out of the mountains just yet. Shoulder dislocation update: in this my 4th month of healing, my shoulder has suddenly gotten much better. The Via Ferrata hikes (that involve rock climbing) were initially hard on it but seemed to accelerate its healing. I'm now intensifying my efforts to regain mobility and strength in the last reluctant corners of the injury. At this point, I am expecting a 100% recovery--and soon!